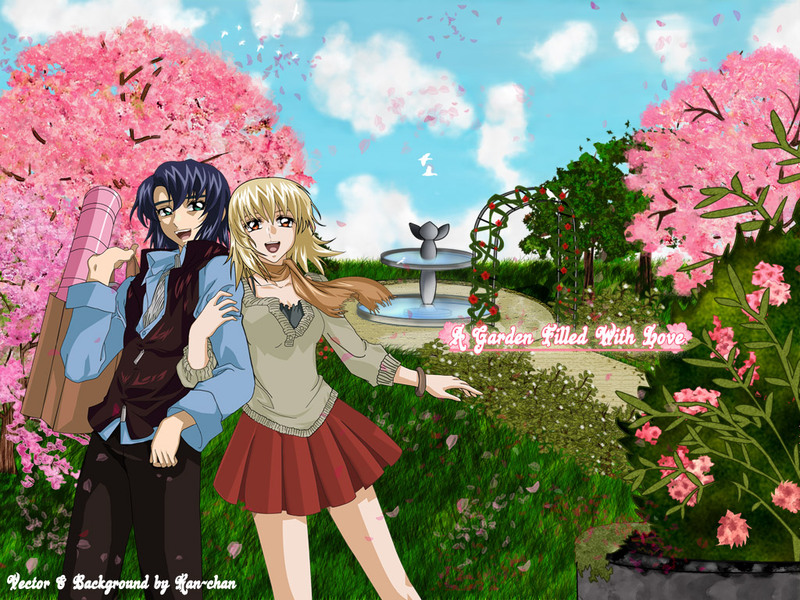 oh my gosh this is so pretty..oh i love this the vector is so pretty i love how there posed and there outfits..wow.. your so talented..and the background with the with the cherry tree and the pink petals and the water fountian and the hanging flower thing..hehe.. oh everything about this i love..wow..this is so pretty. *---------* this is my fav pic for now, they look so good together and so happy! just amazing! awesome work! OMG. Can't believe you actually managed to vector/clean up the picture... or whatever it was you did from the magazine picture the image came from. It is a well-matched couple. how lovely ^-^ You did the bg very nicely. But there are a couple improvements I can suggest. The water fountain seems like its hovering over the grass, or its creating a forcefield around the grass to squish it down (this is just my imagination speaking..haha), because i see that the grass is pretty long, but it doesnt go over the fountain. Do you know what i mean? Some parts of the bottom of the fountain should have the tips of grass covering it. the cherry blossom trees are pretty, but maybe a little too bright (just the flower part, and not the trunks or the branches)? it would look nice (and this is just my opinion) if you duplicated the cherry blossom tree layer and made the copy layer a screen setting over it, and adjust teh opacity. the bird on the garden fence/arch is a little too big - since hes more in the distance, the bird should be a little more smaller. But overall this is a great wall - it looks like a collage! It's very nice! I really like how you've improved the quality of the picture and vectored it, awesome job. The background scene looks very nice as well but...the cherry trees look a little out of place in the scene...they look too real in my opinion. I understand that you took it from a photo but perhaps if you vectored that too, it wouldn't be out of place. LOL, though, it would take you longer to do. The vector looks very beautiful, they look so pretty. I also love the way how you blended everything together. The shades, hues, and highlights complement each other very well. Athrun n Cagalli is da best couple! i always like ur art! sorry Kan-chan, i would like to add to my fav but i cant see the add to fav tag. :( got some error... maybe i'll add it some times. This is really cute. 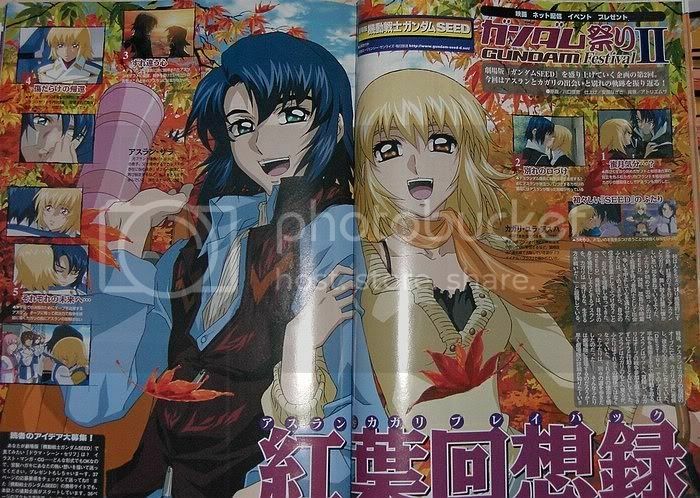 I love Athrun and Cagalli here. You are talented as ever ms. kan-chan. You are truly one of a kind. What you have done here made me so speechless... Hehe... Lol. I have to say you have done so many amazing details that makes this wallpaper standout from a far view. Not only is the background very attractive, the plants there blend so well with the characters. The colors are just so adorable and you have a great taste with colors. Now for the characters... You've tried to make it like Hisashi Hirai-sama's style... Well, you've done a pretty good job. It's not totally like his but this does the trick. I like the way you designed their clothes-- totally suits the scenery. And their expressions are just so cute. wow ...........this is beautiful wallie,i like it. kan-chan u are the best. wow, that's a really lovely wall of asucaga!